CJ Affiliate is one of the largest affiliate networks out there; if you’ve been in the affiliate marketing business for any amount of time, you’ve probably come across it at some point. Just about every major merchant has their offers listed on CJ Affiliate (formerly Commission Junction), making it as close to a one-stop shop as it gets in the affiliate industry. Most advertisers have multiple creative sizes available, which forces more decisions but ultimately gives affiliates more control over their performance. In other words: if you can’t find an affiliate offer that makes you money from the CJ Affiliate database, you’re probably not going to make it. With thousands of merchants on the platform, CJ Affiliate makes it relatively easy to segment and compare. Getting the affiliate code to use on your site is also pretty straightforward; once you’re approved, you can be running dozens of different affiliate offers on your site in a matter of hours. Affiliate marketers will get out of CJ Affiliate what they put in. Though there may be a few exceptions, it’s definitely not a “set it and forget it” monetization solution the way AdSense and other display networks are. Optimizing revenue requires constant monitoring and tweaking, at least for the first several months. Large Network. CJ Affiliate has more than 3,000 merchant partners, many of whom have dozens of creatives sizes and affiliate link options. So regardless of your niche and your affiliate strategy, you should be able to find something that works here. Reliable Payment. The net-20 payment terms mean that you’ll get your commissions in a timely manner each month. End of story. Powerful Reporting. The reporting capabilities are pretty impressive, which is a major advantage for those who plan to spend a considerable amount of time optimizing performance. Steep Learning Curve. While the reporting capabilities are powerful, they’re also a bit tricky for beginners. You’ll need to spend some time in the reporting dashboard before you’re able to navigate with ease and take full advantage of the tools provided. Limited Customer Support. Given the large number of affiliates and merchants, it’s understandable that support is limited. But having a contact form as the only path to support can get frustrating, especially if you’ll be in need of technical support. For more on CJ Affiliate, check out our in-depth network review. 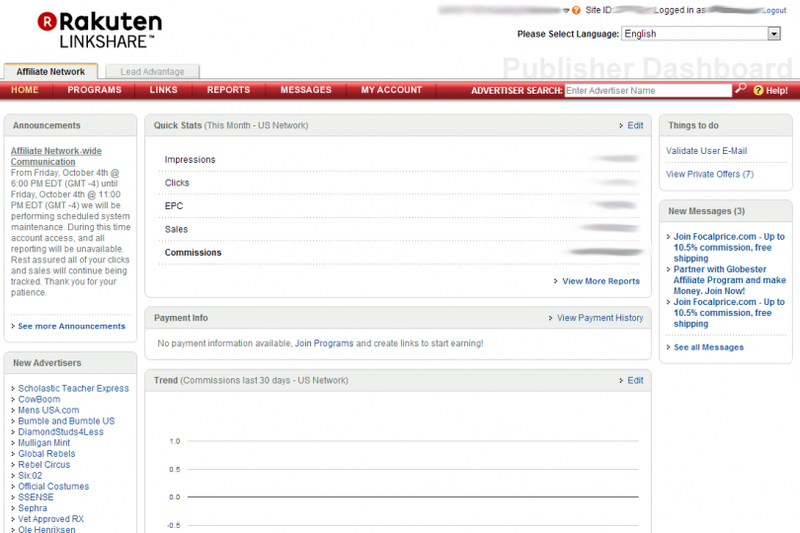 Rakuten LinkShare is one of the oldest affiliate marketing networks, but is now quite a bit smaller than some of the bigger players in the industry. CJ Affiliate, for example, has nearly three times the number of merchants, including a significant percentage of the LinkShare merchant base. When starting the search for affiliate offers that monetize well, it’s best to begin with as large a field as possible. 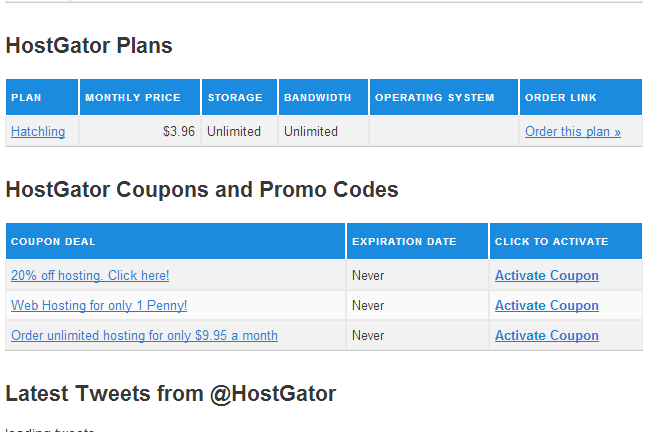 There are a couple slick features of LinkShare that differentiate this platform a bit. For example, the ability to automatically rotate through the different banner ads for a particular product is a big advantage both in terms of administrative burden and optimization. Instead of manually selecting which 300×250 ad you want to run, LinkShare lets multiple versions rotate with only a single snippet of code. LinkShare also allows more flexible “deep linking” to specific merchant landing pages, which in turn allows for increased customization of the campaigns run. Ad Rotation. This seems like a minor feature, but it can make a big difference on time spent and optimization success. Deep Linking Flexibility. LinkShare lets affiliates pick the page they send clicks to within a merchant site, giving them more flexibility to determine the optimal funnel for promoting affiliate purchases. Smaller Network. Rakuten has about 1,000 merchant partners, which is considerably fewer than CJ Affiliate and ShareASale. Though there are plenty of good merchants on this platform, your time will generally be better spent fishing from a deeper pool. Unpredictable Payments. LinkShare pays out to affiliates once commissions are collected from merchants, which results in erratic and sometimes delayed payment. Compared to the net-20 of CJ Affiliate, that is a pretty significant hassle. For more on LinkShare, check out our in-depth network review. By some measures Amazon has the largest affiliate program out there, with products from more than 1.6 million sellers (basically anyone who offers products on Amazon) and hundreds of thousands of affiliates. 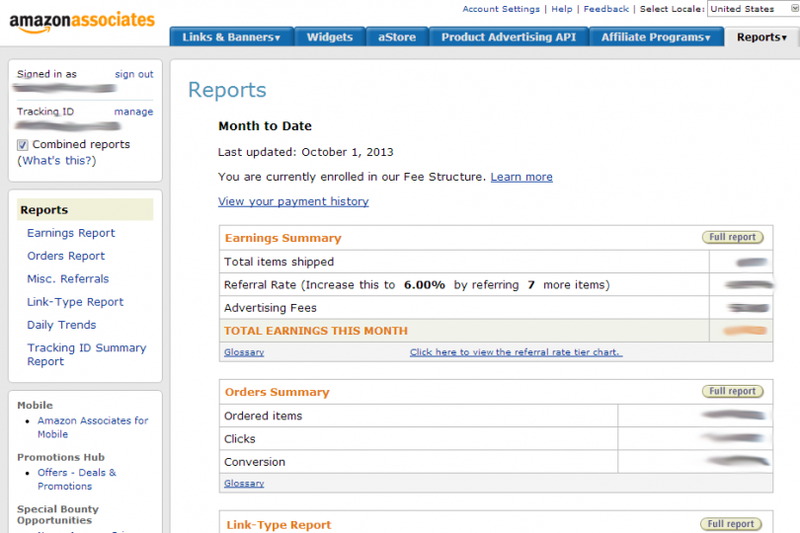 Amazon has the most intuitive and easy-to-use technology of any affiliate program. Beginners with limited tech expertise will have no problem getting up and running, while more sophisticated developers can get fancy with the APIs and advanced implementations available to them. 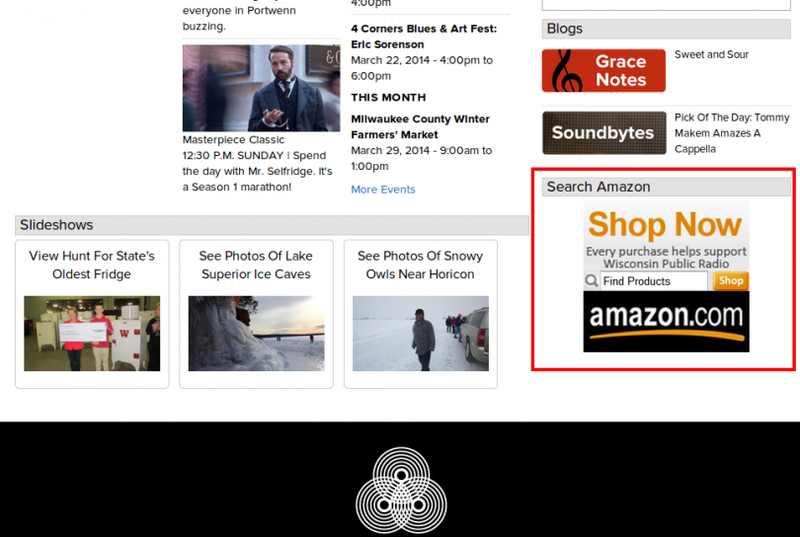 Several podcasts have a similar arrangement, asking their listeners to support the show by clicking through the Amazon link on their site. This type of affiliate model really only works with Amazon, since anything from baby food to flying robots can generate revenue if purchased through an affiliate link. For other models, see our feature Five Proven Affiliate Marketing Strategies. The biggest drawback of Amazon is the commission structure. Commissions start at just 4% of sales for smaller affiliates, though they can climb as high as 15% for higher volume referrers. And because most of the products sold on Amazon are physical goods, affiliates also won’t have many options to refer sales that generate recurring monthly or annual income. Ease of Use. Amazon’s interface is clean and user friendly, for both beginners and professional developers. Most Flexibility. Millions of products can be purchased through an Amazon, giving the ads and affiliate links very broad appeal. Low Commissions. Commissions starting at just 4% mean that affiliates will need to generate a significant number of sales in order to make their business sustainable. Longer Payment Cycle. Amazon’s affiliate program features net-60 payments, which means affiliates won’t get their money for more than two months after a sale occurs. For more on Amazon Associates, check out our in-depth network review. ShareASale is another of the largest affiliate marketing programs out there; the platform has about 3,800 merchants listed. About 1,000 of those are exclusive to ShareASale, and affiliates are able to see only merchant offers not available elsewhere if they want to focus their efforts. 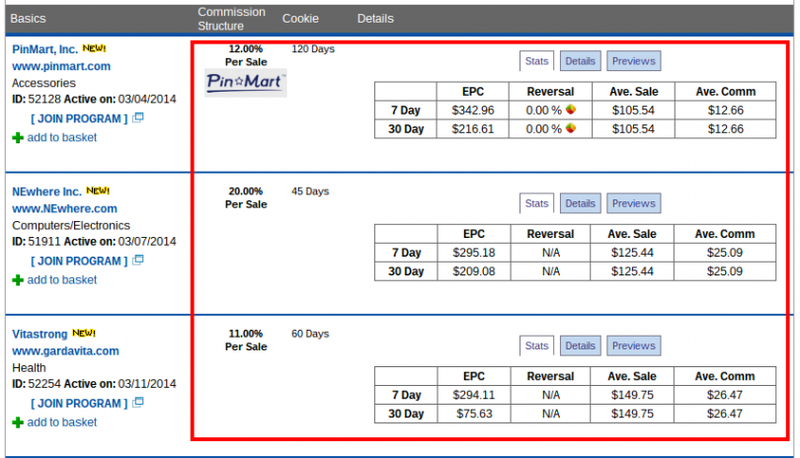 ShareASale also publishes a significant amount of data on each of the offers running, including Earnings per Click, Reversal Rates, Average Sale Amount, and Average Commission. While these figures aren’t guarantees of payouts that affiliates can expect going forward, they’re certainly helpful in evaluating the attractiveness of a campaign. Large Network. The 3,800+ merchants include more than 1,000 that are not present on any other platform. Easy Offer Comparison. When trying to choose from the numerous offers available, ShareASale makes it easy to evaluate the various offers based on key metrics. Quick Payments. ShareASale pays out on the 20th of each month, assuming your balance is more than $50. Clunky Reporting. The ShareASale reporting interface feels old, and is generally harder to use than other networks. You can eventually figure out how to navigate and see the data you need, but it definitely takes some getting used to. There is no rule against using multiple affiliate networks at the same time, and we would generally suggest doing so as a best practice. Though it adds a bit of extra work, this approach will let affiliates compare the various features of different platforms directly. It’s also worth noting that many merchants, especially the larger ones, utilize multiple affiliate marketing networks to sell their products. So if you have the time to set up multiple accounts and plan on investing in finding the best offers for your site, it’s ideal to run all of the networks above. 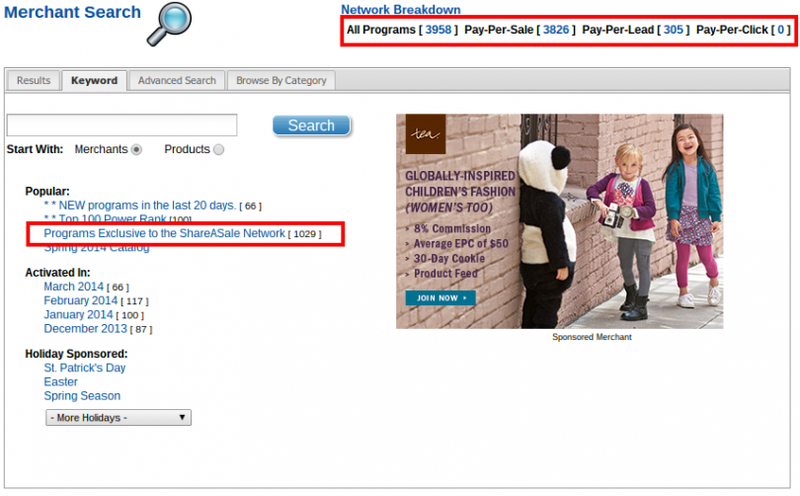 If you want to keep things simple with a single network, ShareASale or CJ Affiliate is probably the way to go! We do hope you these tips help you succeed. Best of luck for the future Duke! I love learning about how to make money by not working! My marketing company is going down the tubes right now but this might be what I need to succeed! I use shareasale and they are awsome.